In conjunction to using simultaneous equations in the form of matrices, the inverse matrix is used in order to find a relationship between the two before solving the pair of simultaneous equations. To see how, it is best to go through an example. Therefore, In order to solve the simultaneous equations for matrix X, the inverse of A must be found and pre-multiplied to matrix C. Note: It is A^(-1)*C not C*A^(-1). The inverse of A is multiplied BEFORE C.
It should be reminded that the solution to a pair of simultaneous equations represent the coordinates that the two lines cross. In the case of inconsistent equations, the two lines used in the simultaneous equations are parallel and therefore will never intercept with each other. 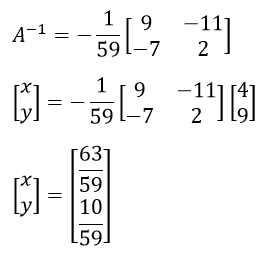 Both of these equations have a gradient of -0.5 but have different y-intercepts. This means the lines will never meet with each other. Rather than having no solution, sometimes there are indefinitely many solutions and hence no unique solution. This occurs when the two simultaneous equations lie on the same line. When plotted, these two lines are exactly on top of each other. This means that the equations are dependent and that there is no unique solution.